Shirdi Sai Baba Stories,Leelas and Teachings. 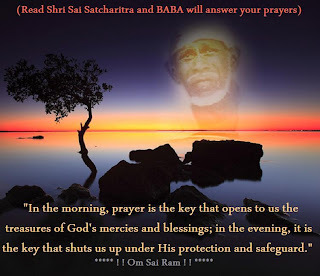 : Shirdi Sai Baba's Grace-Experience Of Sai Devotees-Part 38. Shirdi Sai Baba's Grace-Experience Of Sai Devotees-Part 38. 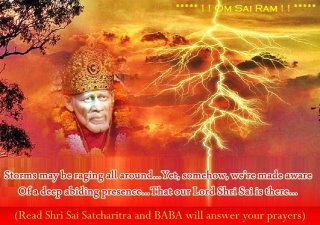 The father of all human being Sai Baba is the God incarnate in human form. A mortal cannot quantify His greatness.! His greatness is like a deep ocean and His love is like the never ending sky.We relentlessly read and hear His leelas. Its a unquenching thirst of thirsty soul in search of their Guru's grace . Baba's way of interacting with His children is unique and inscrutable.His power of healing ,protecting and blessing His children are beyond the comprehension of human mind. Every week His children are sharing these feeling through the medium of this website and we all are able to satiate our thirst to some extent. 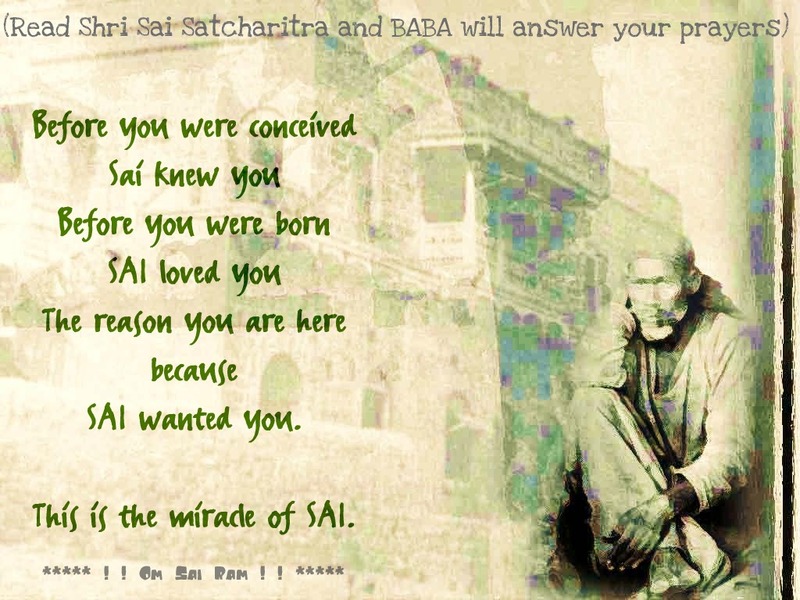 Given below are experiences shared by few Sai devotees. Let us read and absorb Sai's love through these shared blessings. How are you? I would like to share my experience with you. If you can pusblish my experience of Sai baba with devotees,I will be very greatfully to you. Please don’t put my name or my email id and you can edit or remove any sentence if you like. Last week I have sent an email regarding my last week of vrat, and my husband is not available on the Thursday to take me to Sai baba temple as he was having night shift. I was not feeling good about not going to temple on that day. My husband said he will take me on Sunday but I wanted to go on thursday itself that too with my him. So I have decided on Wednesday that I will drive by myself to the temple with the blessing of sai baba. (As the temple is too far and need to take freeway and cross city lot of traffic. I am afraid to go from freeway). So Wednesday night I took GPS from my friend and took the print out of directions to temple. On Thursday I got up 5am, finished my pooja went to work. Evening I came little bit early from my work, I told my patents to be ready before I come from work with kids. When I came from work all were ready to go. I had my shower did pooja and started for temple taking baba's name and chanting. (I was afraid here for two things, one how I will go that far it is one hour drive and freeway and I am taking kids and my parents. Second thing is younger son, he just recovered from fever n cold and he is still a bit cranky and don't want to sit in the car for long time). With the grace of Sai baba I reached temple but for half an hour I was just searching for the temple I wanted to be there for harti but by the time I reached there harti was finish and few people were leaving. I was like upset but immediately I took baba's darshan and started distributing prasadam and 9 vrat books to everyone. Here again I had a problem I bought 9 vrat book in Telugu but all the devotee were north India they only know English and Hindi . A few Telugu devotees don't no how to read Telugu. I was upset and praying for sai baba like please forgive me If I did some wrong anywhere in doing pooja. Distributing prasadam was finishing still I was having books. I went to the baba and was praying again, I met my friend there she took one book and she introduced to her friend she also took the book. To my surprise my friend was performing sai baba abishekam. I saw complete abishekam and saw Shej harti. (You know at that time I thought that's why baba made me search for temple for half hour so that I can miss doop harthi and see abishekam and Shej harti.) I was very happy but still I was looking for Telugu speaking devotees to give the book. During Shej harti one by one all the devotees started coming few are Telugu speaking enough to distribute my books. At the end I was happy everything went well and my kids were ok in the temple did not disturb me. And I reached home safely at 10.45pm. Actually I have started this vrat for my husband to get a nice job. He got a odd job not in his profession and needs to go only twice in a week. Literally we are not having any cash, household items I was buying from the credit card but to pay credit card bills I was not having enough cash. I was just praying baba to do some thing as Immediately I needed cash, We have business as well even that is stopped, no one is buying the stock so I was praying to baba like ' baba if u think still there is a time for my husband to get the job, then at least if some stock moves we will get the money . On Friday I got messages from my bank to give a call to them regarding my account. I was busy on Friday with Ugadi festival I have forgotten to call them. On Saturday I have called the bank they said my saving account is overdrawn and I need to put cash immediately. I don't know what to do? My husband is not having cash and I am not having cash. I have used money from my younger son account as well. Then I thought let me check my elder son's account, he should be having some. His account is just his school fees we only deposit school fee amount in that and forget it never used or opened that account for maybe 1 or 2 years. When I have opened his account, I was surprised thought I am not looking properly. I went into detail record and checked everything. I was in tiers I immediately showed my husband he said to me go and look properly in laptop on big screen it is not possible to have that much money in that account unless school is not debiting the fees. I did not believe at that time. You know the amount I have seen there is almost my salary actually little bit high to my salary it is enough for us to run household and bills for two months. I was so so so happy I might have thanked sai baba million times. My husband every month used to transfer school fee to my son's account and sometimes he transferred twice due to that the money is piled up there. I am very happy that Sai baba has showned us money in this way. Manish ji thanks every much for your support and please if possible publish this Leela . I have promised baba I will publish his Leela if my husband gets a professional job. He did not get a professional job but he got a job. It is very lengthy mail; you can cut it or make it short. By the grace of sai baba, if my husband gets a professional job, I will write the leela again. 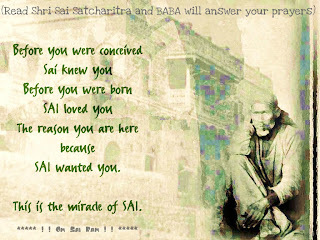 Always thinking of Sai Baba. 1) It was miracle to have been gifted with a son when Doctors declared that there is no hope .As the delivery was critical and only baby or mother will survive. But by Baba's blessings the operation was successful and both mother and baby were safe.My wife had full faith in Baba. 2) When I was struggling to get a permanent job, I prayed Baba to help me in this matter and I promised i will visit Shirdi. I got a permanent job in a govt. organization and my life changed. I visited Shirdi and my faith in Baba increased many fold . 3) On many other difficult situations Baba helped to overcome those diffuclties.Our prayer were only directed to Baba and faith was kept strong .This was reflected by Baba by His love and care on our family . 4) When my first VISA application was rejected for some reason, I left hope. I prayed Baba sincerely to solve the problem. Next time my VISA got approved and I could travel to US.Whether we regularly do His prayer or not but Baba regularly takes care of His children . Baba knows how and when to take care of the devotees. All we need is faith in Baba, Sincerity and Patience - Always have Sraddha and Saburi.ALl this year our faith have increased step by step .And we have learnt the simple path of love and faith on Baba . May Baba's blessing with you. 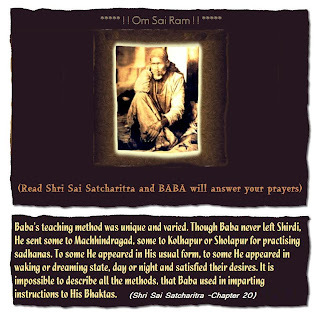 Blessings of Sai Baba.In April 2010, I and my husband went to Shirdi.A friend of mine had told me that if you touch the Samadhi, your life will change. We went to Samadhi Mandir but could not get a chance to touch Samadhi. Next morning again we went to Samadhi Mandir. While standing in the queue a couple was holding a baby of about 1 year old. I kept on looking at him and this time prayed to Sai baba to let me touch his feet.When I reached in front of samadhi, I said to my husband I wish I get a flower from Samadhi. My husband was behind me. When we reached near Samdhi, the gate was open and my only wish was that it should not close so that I can touch the feet of Sai.As we neared Samadhi, the priest picked a bouquet from Samadhi and gave to me and my husband and said "YE LO 2 IN 1"(Enlish translation-Take this two in one). I was overjoyed not knowing the intent of Sai . Then while coming back to Delhi from Shirdi we had a stop at Nasik station. In the waiting room again there was a very cute baby about 7-8 months. I said to myself I wish I too had such a cute baby.After 1 month my pregnancy tests were positive although we had no planning. "Now I remember how priest said "Take this two in one".Through him Baba blessed us. Sai Baba blessed me cute baby whom my parents call with love "SAIEESH".Here is another incident..My parents named him Saieesh. And after a week we got a CD from Shirdi .On back of it was written Saieesh company.Another blessing from Baba to us. I love BABA so much.Thank you . Or you can post directly by going here in the form given . My Shirdi Sai Baba-Experience By Sourav.